forgive us for not getting around to it last week, but this humble space recently celebrated our 13th year of contiguous blogging. tho that isn't a record in blogtopia, and yes, we coined that phrase, it is something to blog about! ok kids, this is my first attempt at blogging. why blogging? because i can. it's a lot like mt. everest in that way. we are all climbing the peaks of cyberspace to get to the pinnacle (or is it pinochle? i prefer canasta). the web is one huge library full of books that didn't have to go through an editor to get published. is that good or bad? in truth, it's neither (ok, i've seen some of these blogs, you're right, it is bad). but nonetheless, as the french say, pass the fries! i gotta start off with thoughts about mr. bush's speech. didn't work for me. not me personally, but my stock portfolio. i spent most of this morning selling at least half of my holdings. one sep-ira which i had started in 1993, and had doubled in value by 2000, had fallen all the back to original value plus $50 as of end of trading today. i hate to tell you kids this, but we're in the middle of another great depression. that's ok, though, i'm old enough that my parents grew up during the first one, so i know some good techniques for saving money. ken houghton, jim yeager, george, mahakal, tami the one true, rj eskow, holden caufield (formerly of first draft), g.d. frogsdong, carnacki (formerly of the mystery of the haunted vampire), and of course, pudentilla. 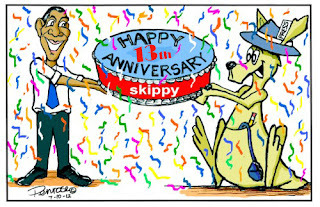 a big thank you also to brett penrose, who provides original cartoons to this humble space, including the one above w/obama and skippy sharing a cake (makes sense to us!). also we must needs give mad props to lauren bruce, blogger extraordinaire and html genius, who designed our blogging template. 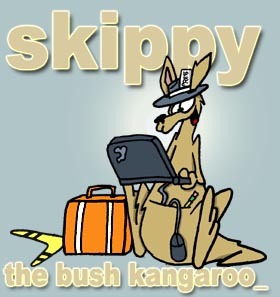 and to august j. pollack, the brilliant artist/blogger who drew our beloved roo logo. and of course, most of all we owe this blog's very continued existence to our enviromental editor and right-hand woman, cookie jill, without whom this space would have completely disintegrated into the cybervoid years ago. but of course, the biggest thanks goes to you, dear reader, for sticking by us all these years, and coming back for more. thanks so much for being our friend. jane hamsher was an early supporter of this blog, and we of hers. 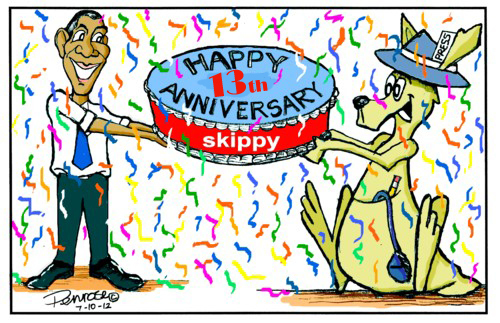 jane and skippy shared some intense political discussions over a couple of lunches back in the jurassic period of blogging, and she was always there when we needed her. we remember when we attended the first netroots nation (back when it was called yearly kos). aside from the marvelous firedoglake breakfast that jane and her staff hosted for attendees who wished to eat that day, jane was on a panel of speakers in the main hall. she was gracious enough to allow skippy to get past the bouncer who was making sure no hoi-polloi approached the likes of glenn greenwald (less they make him defend his aburdities in person) and chat nicely with her for a few before the program began. that's how much of a mensch jane is. we were honored to have a few articles published at firedoglake. and tho it had its detractors, no one can deny its importance and the influence that blog had on the tenor and direction of discussions in blogtopia, and yes, we coined that phrase. we wish nothing but the best for jane in the next chapter of her life. is kale making people sick? take the quiz: cosby or trump defence? how can we trust you to take on isis when you're scared of donald trump? "i love white people. seriously!" major internet providers slowing traffic for thousands of users across the u.s.
“It was funny,” he continued meditatively, “how we went on believing that in some mysterious way poverty "strengthened character," "developed initiative," "stimulated industry," and did all manner of fine things; and never turned our eyes on the millions of people who lived and died in poverty with weakened characters, no initiative, a slow, enforced and hated industry. My word, John, what fools we were! do you have to believe in god to take the declaration of independence seriously? why is internet in the us so expensive? have fossil fuels already lost to renewables?